The CCAAT element binding protein family of transcriptional factors consists of at least six members of the basic leucine zipper DNA binding proteins that bind to the same CCAAT palindromic DNA sequence through homo- or hetero-dimerization with the same family members. C/EBP β has been shown to play an important role in mediating the effects of the LH/hCG in ovarian development. C/EBP β was also found increased in ovarian cancer and correlated to ovarian cancer progression. We assessed the C/EBP β expression pattern in the normal and neoplastic conditions of the female genital tract by immunostaining the normal cervix – 10 cases, squamous intraepithelial lesion (SIL)-10, invasive squamous carcinomas of cervix – 10 cases, normal endometrial tissue – 10 cases, and invasive endometrial adenocarcinomas carcinomas-10 cases. The staining pattern and intensity were graded from 0 to 2+. Results were statistically analyzed utilizing JMP 4.1. C/EPB β expression was detected in the normal proliferative squamous, dysplastic and malignant squamous epithelial cells. There was no statistical correlation between C/EPB β staining in benign squamous, endocervical tissue, SIL, and squamous cancer, as the majority of all stained positively (91%, 79%, 71% and 89%, respectively, p = 0.3448). However, endometrial carcinoma was significantly more likely to stain positively with C/EPB β than benign endometrial glands (92% versus 3% respectively, p < 0.0001, Fisher's exact test). C/EBP β is more likely to be preferentially expressed in endometrial adenocarcinoma as compared to benign endometrial tissue. There is no difference of C/EPB β expression in squamous neoplasia of the cervix. The CCAAT element binding protein family of transcriptional factors consists of at least six members of both functionally and structurally related basic leucine zipper DNA binding proteins that bind to the same CCAAT palindromic DNA sequence through homo- or heter-dimerization with the same family members . The C/EBP family members include C/EBP α (C/EBP), C/EBP β (also known as NF-IL6, LAP), C/EBP γ (Ig-EBP), C/EBP δ (NF-IL6 b), C/EBP ε (CRP-1) and C/EBP ξ (CHOP, GADD153) . The target genes of the C/EBP family members are diverse and involve in a variety of different cell processes including metabolism, hematopoiesis, adipogenesis, immune system, and cancer. The expression patterns of these members within the tissues often overlap, but the function of the each member of the C/EBP gene family shows significant difference. C/EBP α plays critical role in terminal differentiation of adipogenesis and hematopoiesis, and the lack of C/EBP α in mice result in severe hypoglycemia and postnatal death . The function of C/EBP β is much different from those of C/EBP α. The mice lacking C/EBP β are viable but with hematopoietic defects, immune defects and the increased susceptibility to infection, because C/EBP β was known to regulate the cytokine gene expression in macrophages and monocytes and involves in bacterial killing and phagocytosis [3, 4]. It was also shown in the knockout mouse model that the mice lacking C/EBP β exhibited defective reproduction, and C/EBP β mediated the effects of luteinizing hormone (LH/hCG) in ovarian follicular development and corpus luteum formation in the female reproductive tract . Despite of extensive studies of C/EBP functions in tissue culture and mice, the link of C/EBPs to human diseases is sparse except that the C/EBP ζ (CHOP, GADD53) is known to involve in t(12;16)(q13;p11) in myxoid liposarcoma . A few studies to link the C/EBP β expression in human cancers showed that the expression levels of C/EBP β correlated with ovarian epithelial cancer progression and invasiveness of colorectal cancer [7, 8]. Since LH plays critical role in development and function of the ovary and LH is a pituitary peptide trophic hormone regulating the steroid hormone production, we would like to know if C/EBP β directly involves and regulates the proliferation of the cervix and the endometrium. We sought to expand the C/EBP β expression to human cervical and endometrial cancers and reported here the expression pattern of C/EBP β in normal cervix, endometrium, cervical and endometrial carcinomas. We have performed the immunostains for C/EBPβ in cervix and endometrium to determine if there is any change in expression in normal cervix, dysplastic cervix, and invasive cervical carcinoma. We also determine if there is any change in expression in normal and endometrial carcinoma. We stained 10 cases of cervical dysplasia, 10 cases of cervical invasive squamous carcinoma, 10 cases of benign cervices from hysterectomy specimens for leiomyomas, 10 cases of benign normal endometrium from hysterectomy for leiomyomas and 10 cases of endometrial carcinoma. C/EBP βis present in normal proliferating cervical squamous epithelial cells, namely, the suprabasal layers (Figure 1). The superficial layer (the most mature layer, equivalent to cornified layer of the skin) did not express C/EBP β. Surprisingly, although the basal layer of the squamous epithelium of the cervix also proliferates, the basal layer did not express C/EBP β. In addition, the C/EBP β is present in the endocervical glandular epithelium (Figure 1). A few scattered endocervical stromal cells also express C/EBP β, suggesting that there is a stromal proliferation during the normal menstrual cycle. There is strong staining signal within the squamous metaplastic cells within the endocervical glands (Figure 1). There was strong staining signal in the squamous dysplastic epithelium and invasive squamous carcinoma cells. No difference in expression patterns in dysplastic squamous epithelial cells or cervical carcinoma cells (both in-situ and invasive) was seen. There was no statistically significant difference in expression of C/EBP β between dysplastic and invasive squamous epithelial cells (Fisher's exact test). However, the absolute number of stained cells was found to be significantly more in the cancer specimens, which may reflect the higher percentage of cells in proliferative phase compared with the normal cervical epithelium. Expression pattern of C/EBP β in benign, dysplastic and malignant cervical tissues. Benign cervical tissues include normal, squamous metaplasia, endocervical glandular epithelial cells and stromal cells. Dysplastic and invasive carcinoma tissues are listed. The microphotographs were taken at the magnification of 400X. Endometrium also expresses C/EBP β. In the normal proliferative endometrial tissues, the expressions of C/EBP β were primarily restricted within the epithelial cells (Figure 2). Rare staining signals were seen within the endometrial stromal cells. The level of staining intensities in the weakly proliferative endometrial epithelial cells was relatively low, and the staining signal was weak (1+). In proliferative endometrium, the level of expression was increased, but still much less than those seen in the malignant epithelial cells. In the endometrial carcinoma, the staining signal was strongest (2+). Statistically, endometrial carcinoma was significantly more likely to stain positively with C/EPB β than benign inactive endometrial glands (92% versus 3 % respectively, p < 0.0001, Fisher's exact test). 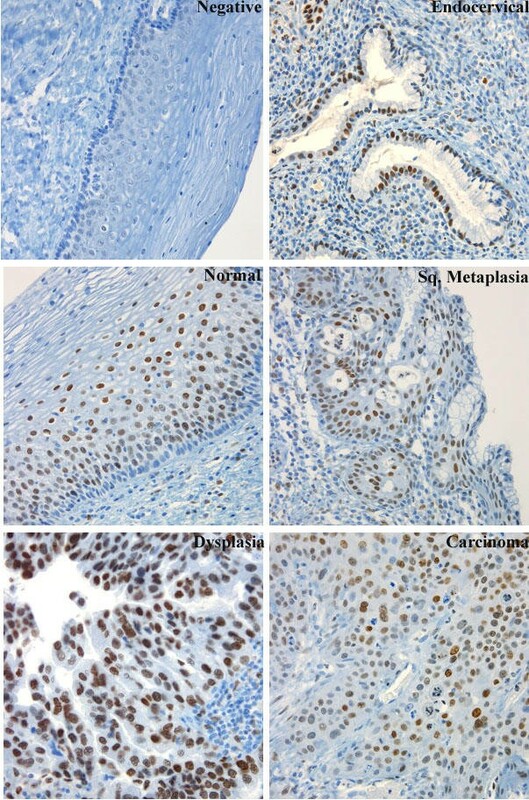 Expression pattern of C/EBP β in benign and malignant endometrium. Normal proliferative endometrium, weakly proliferative/inactive endometrium and invasive endometrial carcinoma were listed. The photographs were taken at the magnification of 400X. We have studied the expression pattern of C/EBP β in normal, dysplastic and malignant cervical epithelial cells. It is known that C/EBP β is important in epithelial differentiation, and the expression of C/EBP βinhibited the keratinocyte growth and promoted differentiation . Our study that the C/EBP β expression was present in the proliferating, not resting or matured epithelial cells appears consistent with the previous observation in rodent keratinocytes . Proliferation of cervical epithelium is known to be dependent on the presence of estrogen, and production of estrogen is dependent upon the stimulation of LH from the pituitary. C/EBP β was shown to be critical for ovarian follicular development and mediated the LH effect in the luteal cells . It is possible that C/EBP β regulates the reproductive process at two different levels. It is interesting to note that in the resting epithelial cells, such as the basal layer of cervical cells, which is known to serve as reserve cells, C/EBP β was not detected. The basal layer of cervical squamous cells serve as "stem cells" for the squamous epithelium, and these cells are known to express PCNA and p63 [10, 11]. However, C/EBP β was only detected in the proliferating cells (suprabasal cells), but not in the basal cells. It is reasonable to assume that C/EBP β is not required for the phenotypic transition from the reserve cells to the more differentiated cells, but plays some unclear roles after the differentiation process is initiated. We have found that C/EBP β was detected in the normal proliferative endometrium, but scarce in the inactive or weakly proliferative endometrium. Endometrium proliferation is estrogen dependent under physiologic conditions, and it appears that there is a correlation between the estrogen effect and the expression of C/EBP β in proliferation of the endometrium, although such correlation was not established at the molecular level. Under dysplastic or malignant conditions, the expression C/EBP β was abundant in both cervical and endometrial tissues. Cervical cancer is related to the human papilloma viral infection, especially high risk HPV groups, such as HPV 16 and 18 subtypes . It has been reported that C/EBP β can directly bind to the regulatory region of HPV 18 viral genome and control the expression of E6 and E7 oncoproteins of the HPV in cell-specific manner . It is possible that high level of C/EBP β expression in the cervical cancer facilitate the viral replication in the cervical cancer cells. High expression level of C/EBP β was also detected in the endometrial cancer cells. It has been reported that C/EBP β repressed the P450 aromatase gene expression in the endometrial epithelial and stromal cells, and plays important roles in endometriosis . Finally, the expression of C/EBP β appears to serve as an important proliferating marker for both the cervical and endometrial cancers, since C/EBP β only expressed in proliferative cancer cells. Several other proliferation markers, such as Ki-67, PCNA and p63, had been successfully applied to pathologic diagnosis and used as a prognostic factor [10, 11]. It is possible that the expression of C/EBP β can be used as a prognostic marker for both cervical and endometrial cancers. More studies are required to establish the link between the expression pattern of C/EBP β and the prognosis of the cervical and the endometrial cancer patients. We have retrieved totally 50 cases of surgically resected specimens from the paraffin-embedded tissue archive in Department of Pathology. These 50 cases included 10 cases of normal cervical tissues and 10 cases of endometrial tissues derived from the patients of benign leiomyomas. There was no documented record of malignant or dysplastic changes within these specimens. Also included were 10 cases of high-grade cervical dysplasia (CIN II-III), 10 cases of invasive squamous carcinoma of the cervix, and 10 cases of endometrial adenocarcinoma. The clinical diagnoses were previously unequivocally made within the department of Pathology at the West Virginia University. The study was internally reviewed and approved by the Institutional review Board (IRB) at the West Virginia University. The paraffin blocks were retrieved, sectioned at 5 micron in thickness, and subjected to manipulation for immunostaining using Ventana Benchmark automated immunostainer (Ventana, AZ) following the instruction from the manufacturer. The antigen retrieval solution and immunostaining reagents were all from the Ventana Internationals (Tucson, AZ). The anti-C/EBP β antibody is from Santa Cruz Biotechnologies (Santa Cruz, CA). The primary antibody was used 1:200 dilution, and immunostaining signals were detected by peroxidase methods. The slides were reviewed by two independent pathologists, and the intensities of the staining signals were semi-quantitatively scored at 0, 1+ and 2+, with 0 being no staining, 1+ being weak in intensity, and stains no more than 10% of the epithelial cells, and 2+ being strong with more than 10% cell staining. Since C/EBP β is a transcriptional factor, and normally only expressed in nuclei, the cytoplasmic and membrane staining patterns were interpreted as non-specific (negative) signals. The results are summarized as the following in Table 1. The staining data were collected, and analyzed using computer software JMP 4.1 from SAS Inc. USA. BA collected the patient's data and specimens, performed the data analysis. PS participated with extensive discussion for experimental design and analyses. PZ and BSD reviewed the histological and immunohistochemical results. The authors are grateful for Ms. Patricia Turner for her superb technical assistance in immunohistochemical staining.